Resumen - Sin embargo, cuando un centro de datos bien diseñado aparece en papel, finalmente su éxito depende de las operaciones diarias a lo largo de la vida útil de la instalación. Uptime Institute has identified a comprehensive set of evidence-based methods, processes, and procedures at both the management and operations levels that have been proven to dramatically reduce human factors risk. 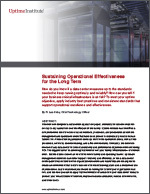 All too often organizations come up short in the operations arena, with ad hoc processes, on-the-fly decision making, and a fire drill mentality. Ultimately, the business mission of any data center is to meet availability and performance objectives while deliveringROI. The biggest barrier to achieving that mission isn’t your facility infrastructure—it’s human error. But the blame doesn’t all lie with front-line facility and operating teams: upstream management decisions can either support reliability and efficiency, or set a data center on the path towards failure when organizational culture and leadership are not aligned to create an environment that fosters success with robust training plans and a disciplined use of procedures. Learn what clues you should be looking for to tell if your organization is at risk, and see how you can to apply Uptime Institute’s Standards in your data center today to protect your infrastructure investment, improve resource allocation, reduce downtime risk, and lower costs.